For a word that’s used far too often, ‘visionary’ actually applies to Joon-ho Bong’s directing. Snowpiercer was done in a fascinating style, it was a sci-fi flick that we didn’t see coming and that pleased us all with its generally awesome atmosphere. Plus, Tilda Swinton is some kind of weird genius, and Bong loves to her cast her in his films. All of what worked in Snowpiercer is back again for Okja, a completely different concept but a similar, oddly wonderful delivery. Okja is an action/comedy with a not-so-subtle eco-message, a drama about the love between humans & animals, and an exposé on the evils of giant conglomerates. Basically, it’s a little bit of everything thrown into one film reel, and the result isn’t the best picture of the year, but it definitely is something you can’t take your eyes off. A large agro-company, Mirando, in an attempt to beef up their image, has started a campaign highlighting the terms “eco-friendly” and “non-GMO”. That doesn’t actually mean much, but as long as the public digs the clean image, they’ll buy the questionable product. Mirando has been breeding super pigs, a meat that is cheaper and tastier, and they’ve selected 26 of the piggies to watch grow up over the next 10 years, before the product officially hits the market. One pig in South Korea, called Okja and raised by a loving girl named Mija, is something special and can actually connect with humans. But when Okja’s number is called, she’s off to the slaughterhouse, unless Mija and a covert animal rights group can save her. The “moral of the story” couldn’t be clearer and the point isn’t subtle, but it’s not stupid either. I dare someone to watch the slaughterhouse scene toward the end or the mating containment center and not feel deeply troubled. 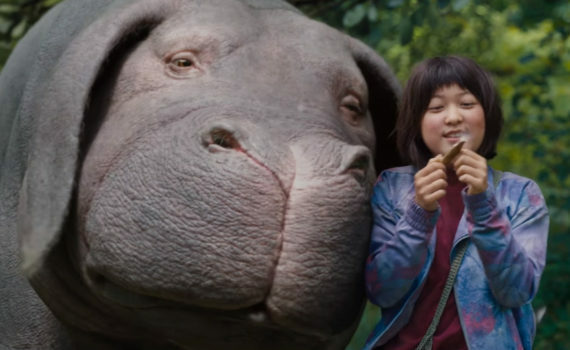 Okja becomes much more than an animal, she elevates to a symbol of the respect humans should have for all that we decide on a whim is below us. Again, there isn’t deep, hidden subtext, you get the meaning very early on, as soon as the film starts actually, but that in no way makes the message less important. Now, on to the movie, which I enjoyed the first half of more than the second, but that’s if I’m being picky. The first half had such wonderful, off-beat comedy, combining wacky music and characters perfectly with serious themes in order to make something truly unique. The second half was much more sad, but for a purpose, and Bong’s directing was spot-on throughout, so no criticism there. Ahn was a heart-breaking lead, Swinton was fantastically evil, Gyllenhaal was as you’ve never seen him before, and I always love when Dano pops up, even in a smallish role. I enjoyed Okja on many different levels, which isn’t something I find myself saying often enough.